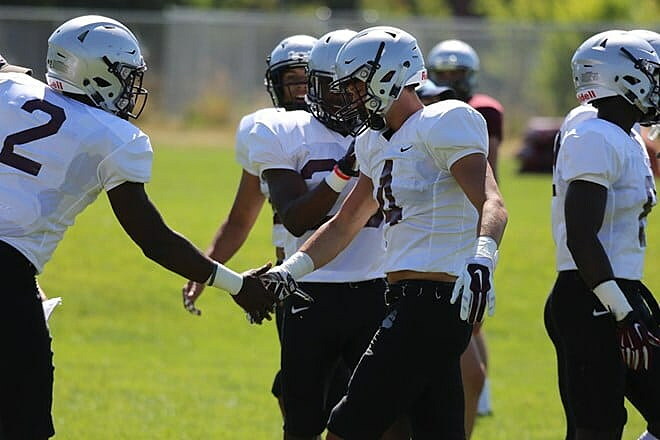 The Montana Grizzlies suited up in full pads for the first time at fall camp on Sunday. Even with only shells and helmets on for the previous four, practice five wasn’t noticeably more physical than previous practices … they’ve been physical all along. What was noticeable was the overall increased level of intensity and execution on both sides of the ball Sunday, putting a smile on Coach Hauck’s face after the session was through. “That looked like a football practice. So, I’m enthused coming off the field, which is great. I like our guys. We’ve gone five straight days, and really had some work before that, and they did a really nice job to fight through it. It was hot, and all the different things we had to deal with, it was good,” said Hauck. In the opening week of camp, the Grizzlies have responded well to practices that may not have been up to Hauck’s exacting standards, bouncing back each time to learn from mistakes and clean it up for next time. For Hauck, it’s a sign his team is maturing and taking on the “Montana tough” personality he’s trying to install. “They’re listening. They don’t go ‘ah they don’t know what they’re talking about,’ they listen to what you tell them, come back out and rally. I was proud of them today,” Hauk added. After emerging as the No. 1 QB at the conclusion of spring ball, junior Dalton Sneed has continued to lead the charge for the Griz, despite competition from new arrivals over the summer. He looked crisp again on Sunday, throwing a nice 10-yard fade to Samuel Akem in the corner of the end zone for a good-looking score. Sneed has looked the most consistent overall during the first week of camp, as one would expect as the other QBs take on an unfamiliar playbook. But after five practices to take it all it, Hauck says he likes what he sees from the entire group. “Like I said at the start, Sneed has been ahead, and he should be. If he isn’t, then he hasn’t been paying attention or working, and that’s certainly not who he is. He’s an attention to detail guy. He’s doing a good job,” said Hauck. Helping make the job of the quarterbacks easier is Montana’s athletic corps of receivers. Despite the move of Justin Calhoun to cornerback – a move most would say has been a fantastic addition for the defense – the Grizzlies’ receivers are still one of the deepest groups on the team, with young stars emerging every practice. After emerging as one of UM’s most dynamic receivers last season, Samori Toure has continued to impress during team runs, seven-on-seven, and even in one-on-one drills where he made multiple tacklers miss in a five-yard sliver of a space. “Samori has had a really nice week. It’s one of those things where they’re coming along. Mitch Roberts is making a push. We’ve got great competition, and it’s one of those deals where you can’t take a day off or rest on your laurels because you’re going to get gone by,” said Hauck. Montana’s offense got rolling at practice five, but in a good display of balance, the defense picked up some nice plays as well. Cornerback Gavin Crow hauled in an interception and returned it to the house for a pick-six early in the practice. Linebacker Jace Lewis got maybe the most oohs and ahhhs from the sidelines today after stuffing a running back dead in his tracks with a crack that could be heard around Dornblaser. Freshman safety Michael McGinnis stripped running back Alijah Lee of the ball in contact and returned it for a score on a heads-up play as well, getting a big reaction from the defensive sideline as well. The Griz will take Monday off before returning to the practice field at Dornblaser on Tuesday at 2:30. With Pearl Jam set to play Washington-Grizzly Stadium Monday, Hauck is hoping the team uses the opportunity to rest the legs before practice resumes, noting that the season kickoff against Northern Iowa is just 20 days away.